The amount of data used by businesses increases with each year. When considering VM data backup, extra storage space is required; for this reason companies try to reduce the space that is consumed by backups, including by means of compression and deduplication technologies. In addition to compression and deduplication of virtual machine (VM) backups, NAKIVO Backup & Replication now supports Dell/EMC Data Domain Boost to make deduplication even more effective. This blog post explains what Dell/EMC Data Domain Boost is, and how NAKIVO Backup & Replication can be configured to enable support for the corresponding deduplication technology. What Are Data Domain Protection Storage and Data Domain Boost? Data Domain protection storage is the industry leading backup storage platform that offers best in class data deduplication, security, and cloud services. Dell/EMC Data Domain comes with the Data Domain Boost protocol, that can provide network and storage efficiencies for backup workloads. Dell/EMC Data Domain Boost is a protocol designed to enhance the interactions of applications with Data Domain protection storage. Data Domain Boost enables you to offload a part of the Data Domain deduplication features back to the source side, where the appropriate application is installed. Data Domain Boost efficiencies shrink backup windows, accelerate data replication, and offer 50:1 storage capacity. When a classic target-side deduplication approach is used, full-sized portions of data are copied from a source (a backed up server or VM) to a target (a backup server with a backup repository) during the backup process. Once the data has been copied to a backup server, the deduplication of copied data is performed (see the first scheme below). In the case of using protection storage, source-side deduplication can be used. Dell/EMC Data Domain is the only protection storage that supports Data Domain Boost protocol for source-side deduplication. The data is deduplicated on a source side, and then the fully deduplicated data is copied to a target via the network (see the second scheme below). As the data size is reduced after deduplication, the data transferring via the network takes less time and network overloading can be avoided. NAKIVO Backup & Replication supports Dell/EMC Data Domain Boost, which speeds up the backup process to Data Domain protection storage. The product can use the DELL/EMC Data Domain protection storage as a backup repository to store VM backups. In this section you can learn more about the requirements and configuration of your environment in order to make it possible to use the DELL/EMC Data Domain protection storage with Data Domain Boost as a backup repository for NAKIVO Backup & Replication. Data Domain (physical or virtual) where Data Domain OS v.6.1 or higher is deployed. Physical Data Domain is a physical server with storage that has Data Domain OS installed. Data Domain Virtual Edition (DD VE) is a pre-configured virtual machine with all required software, which can be run on VMware vSphere, Microsoft Hyper-V, KVM platforms, and in AWS or Azure cloud environments. 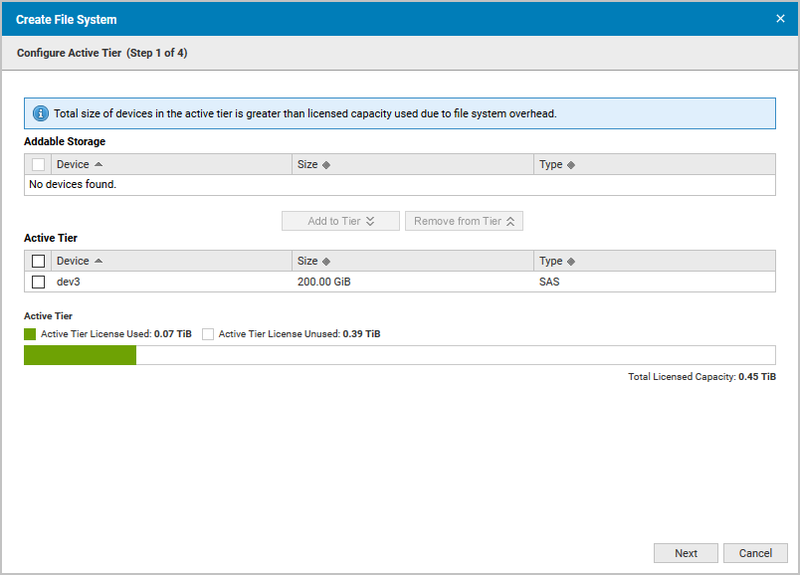 NAKIVO Backup & Replication v7.5 or higher. Only the full solution or Transporter installations can be used. The product must be deployed as a Linux-based virtual appliance or manually installed on Linux operating system. Let’s explore how to configure a system in order to make it possible to use source-side deduplication when backing up data with NAKIVO Backup & Replication. BoostFS plugin must be installed on a Linux machine on which the instance of NAKIVO Backup & Replication is deployed. Installing this plugin allows the configuration of a Dell/EMC Data Domain Boost storage unit as a backup repository for NAKIVO Backup & Replication. Log into Linux, where NAKIVO Backup & Replication is installed. You can create the directory from which a BoostFS plugin package would be downloaded, for example boost_fs_plugin (type mkdir boost_fs_plugin for doing this). Download the archive with a BoostFS plugin. <bfsavt-version> is a version of the BoostFS plugin, for example, 1_0_0-06 (see the screenshot below). The version that you use may differ. Type ls -al to check the content of the directory and the correct package version. Ubuntu Linux is considered in the current example, it is for this reason that the DPKG (Debian Package) package manager is used. SUSE Linux and Red Hat Linux have a different RPM (Red Hat Package Manager) package manager and different installation packages. <ddboostfs_version> is your package version (a version 1.0.0.5_556666 is used in this example). Now you should prepare a Data Domain storage unit to be used as a Backup Repository for NAKIVO Backup & Replication. 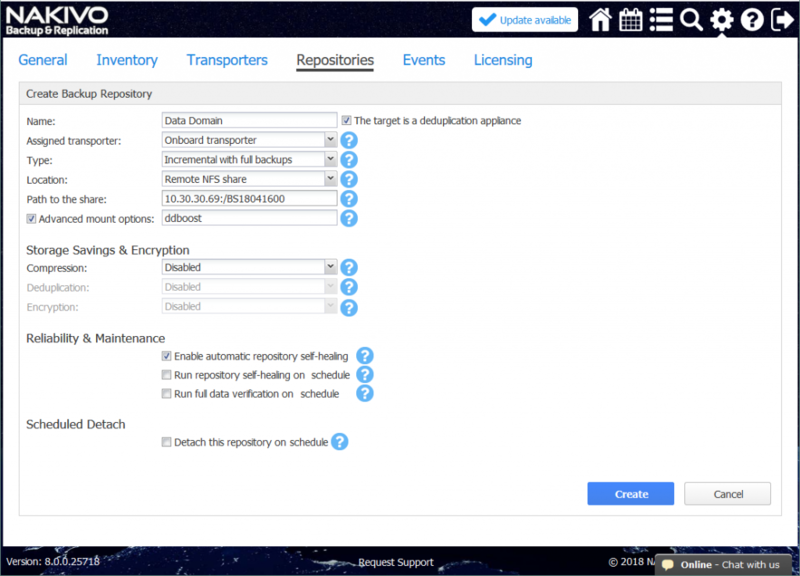 Open the web interface for managing the Data Domain protection storage. Command Line Interface (CLI) is also available. 1. Open the Data Domain System Manager, then go to Data Management > File System. 2. Create the file system if it has not yet been created. In order to create the file system, click “Create” and follow the instructions of the wizard. Step 1. Select the device and click “Add to Tier”. Now the device is added to the active tier. Click “Next”. Step 2. Click “Using only DD Boost for backup”. Step 3. Check the box “Enable file system after creation”. Step 4. You can see that file system creation is complete. Enable a Data Domain Boost protocol. Open Data Domain System Manager, go to Protocols > DD Boost. Click the “Enable” button. After that, the DD Boost Status is changed to “Enabled”. On the DD Boost page, open the Storage Units tab. Then, in Storage Units click “Add”. The “Create Storage Unit” window appears. Enter the name of the storage unit, username, and password. You can use an existing user or create a new user by clicking “Create a new Local User”. Click the “Create” button in the “Create Storage Unit” window. If the operation has completed successfully, you will see the created storage unit in the list of Data Domain storage units. 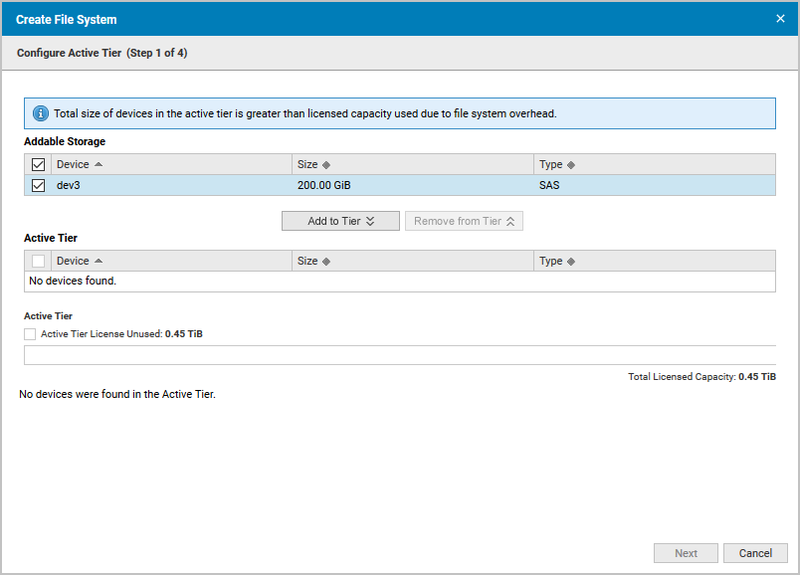 When the storage unit is created, create a backup repository for NAKIVO Backup & Replication on the DD Boost storage unit. Access the console of your Linux machine on which NAKIVO Backup & Replication is deployed. Go to the directory /opt/emc/boostfs/bin/ (type cd /opt/emc/boostfs/bin/ for doing this). <storage_unit> is the name of the DD Boost storage unit, for example, NAKIVO. Enter the storage unit user password and then enter the user password once again to confirm this password. Open the web interface of NAKIVO Backup & Replication. Go to Configuration > Repositories. Click “Add Backup Repository”. Enter the name of the repository, for example, Data Domain. Select an assigned transporter, for example, onboard transporter. Select a repository type: Incremental with full backups. Select location: Remote NFS share. Define a path to the share. In the current example the path is 10.30.30.69:/BS18041600. Check the box to enable the Advanced mount options and type “ddboost”. Due to this option, DD Boost would be used instead of remote NFS share. Check the defined repository options and click the “Create” button. A backup repository is created. Now you can see the attached repository on the Repositories page. Less network load. Due to data deduplication on a source side, less data is copied over the network from a source host to a backup repository; as a result you have less network load. Faster data transfer. After source-side deduplication is performed, the amount of data to be copied over the network is reduced. The less data you have to transfer, the faster the process of copying the data is. Ability to store more data. Dell/EMC Data Domain with DD Boost allows you to reduce storage consumption by up to 17X. Due to the support of DD Boost by NAKIVO Backup & Replication, you can significantly save disk space on your backup repository that is located on DELL/EMC Data Domain protection storage. As a result, you can store more backups as well as perform backup operations more frequently (with less intervals). Less CPU load on the destination backup server. When source-side deduplication is performed, the CPU (Central Processor Unit) resources of the source server (from which the backed up data would be copied) are utilized because deduplication is a processor consuming process. At the same time, the CPU on the destination backup server is less loaded, because the received data was already deduplicated on the source server. NAKIVO Backup & Replication is a fast, reliable, and affordable backup solution. The product includes a wide list of features, such as incremental backup, LAN-free Data Transfer, Full Synthetic Data Storage, data deduplication, and data compression that allows to save space and increase backup performance. Support for Dell/EMC Data Domain Boost by NAKIVO Backup & Replication makes the product even more powerful and allows you to use the advantages of Dell/EMC Data Domain. Use the two solutions to achieve the benefits of source-side deduplication such as higher backup speed, optimized use of CPU, and decreased network load. You can use the DELL/EMC Data Domain protection storage as a backup repository for NAKIVO Backup & Replication, and as a result, save more disk space when storing backups.